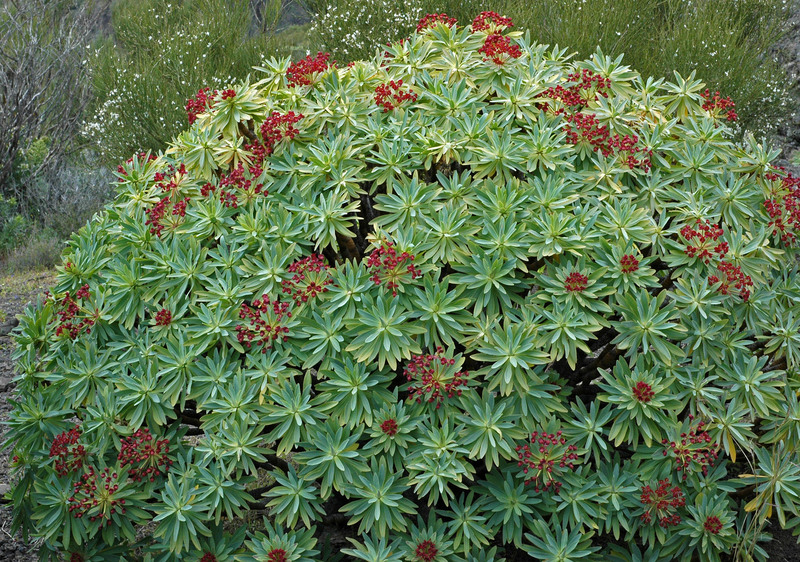 Very rare, this Canary Island Euphorbia is often considered the prettiest in the genus. Of two minds – or two habits – it either grows dome-like as you see below, or very Dr. Seuss-like, with thick, branching, amber-hued, curving succulent stems topped with handsome 5-7" blue-green rosettes. "Blooms" emerge several times a year (lasting for months), which are really eye-bogglingly intense burgundy-red bracts held on stiff radiating stems. The bracts persist as they birth equally intense burgundy 3/4" fruit. Backlit by the sun they're a joy! Excellent drainage is a must in large containers, well-drained rock gardens or hillsides. Evergreen, drought tolerant and deer resistant. To 4' x 4'. Low water once established.